Liz's Paper Loft: MCT September Release Blog Hop ~ a little something! MCT September Release Blog Hop ~ a little something! Well we finally made it to Friday and My Creative Time September Release Blog Hop! You should have arrived from the talented Miss Kim, if not be sure to head over to our fearless leader Miss Emma for the start...you won't want to miss a thing! Great idea, and SO very cute! Super cute project! 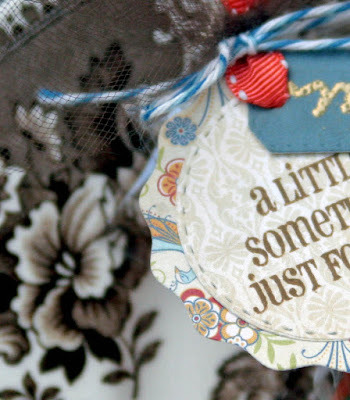 I love your sweet little tag and that is one thing I love about Emma's products is the versatility! You did a fabulous job of showcasing that today! Great job and fun inspiration Liz! Great release once again! Wonderful that you chose to use these for non-Christmas to show the versatility of Emma's products. Beautiful as always. What a FABULOUS idea Miss Liz!!!!! LOVE THIS!!!! Thank you SO VERY MUCH for your sneaky peeks this week too!!! Such an innovative, pretty place card, showcasing the versatility of these products! Your inspiration this week: outstanding! Thanks to your creativity, this release is heading my way! Thank you! AWWWW Your treat idea is so cute.....love that you shared that it is for something other than Christmas!! shhhh secret just between us....shhhh what you showed is my favorite candy.....LOL.........YOU so ROCK!! What a fabulous idea to make a treat place card. This will make your Thanksgiving table even more special. Wonderful job! I like the name on a different tag like you made for gifts. I feel bad writing on the decorated ones that I make, lol. What a cute place setting. So adorable. Those will look so inviting on your holiday table. That is a really cute project. I love the tags on the treat bags, so perfect. I absolutely love the versatility of these sets! Love this idea! What an adorable place card, nicely done! Adorable little tag! I'm sure Michael loved it. Very nice for the Thanksgiving table. Your place card for Thanksgiving is awesome. What a great idea and just shows how versatile this release is. Super cute projects using this release!! Thanks for the amazing inspiration! Very creative! So many things can be made with that tag! Loving this release! 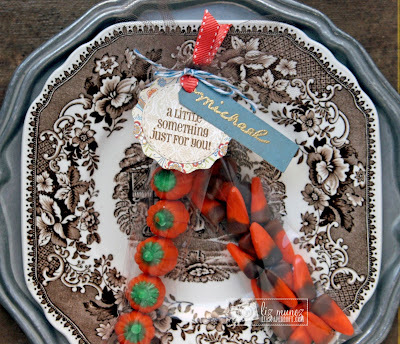 A very cute presentation for your little treats!! This has been a fabulous hop! I can't wait for my happy mail to arrive. You Halloween treat sleeves are darling! Such a cute idea! I love this! Your tag is adorable! Liz ~ Yep I am still here stalking your blog! Okay this is another darling idea!! LOVE how you matched everything with the plates ~ what a clever idea to use this set for placement cards then the yummy little candies too! 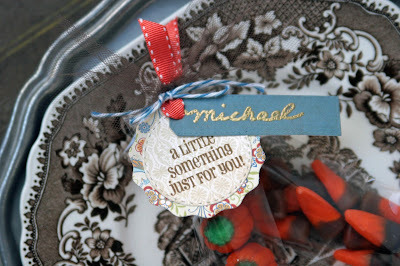 What a great idea for place cards....so pretty & fun!! What a fantabulous place card! Very pretty! I never thought of using this set to make place cards so thank you very much for the inspiration as well! What a fun idea! Thanks for sharing! the sentiment goes great with this cute treat bag!